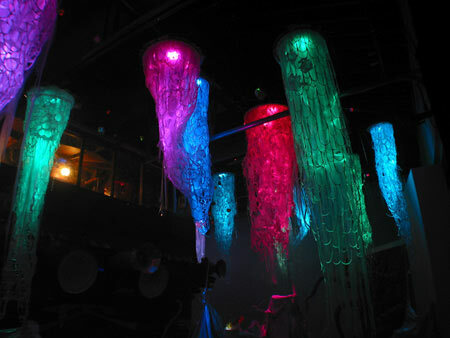 Meow Wolf, ''The Due Return'' (detail), 2011, mixed media installation. The future of art in Santa Fe is thriving, thanks to the imagination and initiative of one of its best artist collectives, Meow Wolf. The group gave birth to itself early in 2008, doula’ed by a pack of creative 20-somethings hoping to kick start Santa Fe’s aging yet respectable art scene into an alternative aesthetic. These days, Meow Wolf pumps blood through young artists’ hearts and minds, with a loose core of about 50 members offering a place where any and all who choose to may contribute to group installations, performances, and exhibitions, none of which have previously taken on the scale of what presently fills the Muñoz Waxman warehouse space here. “The Due Return” rejects any sense of the preciousness of the art object; it is a cultural phenomenon that reflects the raw energy of the youthful collective that made it. Just as the Disneyland ride, Pirates of the Caribbean, has grown beyond itself from mere entertainment into cinematic lore, “The Due Return” is potent as a fantastic backdrop; it is cerebral, as visceral as a pirate’s “aaarrh,” and lots of fun. Purported to travel through dimensions and time, “The Due Return’s” form is that of an old wooden ship, complete with crew’s digs, a scientific lab of sorts, and a hull full of botanical specimens — all of this below its upper deck, where the captain’s quarters, an interactive control room, and a small stage with its own Victorian-style couch are featured. The vessel travels into the past and the future by virtue of such concerns as post-apocalyptic life beyond that here on Earth, the 19th-century urge (which resulted in the founding of many of our nation’s greatest museums) to collect and label specimens of practically everything, sci-fi as an artistic genre, virtual reality — see SecondLife.com — ghosts and aliens, down-home gardening, and Brechtian theatrics. Oh, and throw a little Beuys in there while you’re at it. The ship itself is 75 feet long, 25 feet wide, and 14 feet tall. Its interior embraces a volume of 2500 square feet, split among ten different rooms. Ghostly jellyfish-like organisms float behind the stern, lit by colored globes that convey a starlit night on another planet. The project incorporates video, live performance and extensive interactive elements — lots of joysticks from every imaginable era — that submerge the audience into a fully operational fictitious world. Over 100 artists wound up contributing to “The Due Return.” What they made is the world’s coolest fort ever, complete with atmospheric haze, built according to the laws of play. Unfortunately, the exhibition is scheduled to be de-installed after August 21 — not nearly long enough to allow for its natural process of transformation. Its limitless dimensions of meaning, and the delight of discovery on the part of artist/performers and visitors, beg for a permanent home: CCA, keep “The Due Return” in this time and dimension!